Perfectly positioned along the coast of Georgia, the port city of Savannah, Consistently named one of "America's Favorite Cities" by Travel + Leisure and one of “America’s Friendliest Cities” by Conde Nast Traveler and Travel + Leisure is synonymous with hospitality. Often nicknamed the Hostess City, Savannah is the birthplace of Juliette Gordon Low and the Girl Scouts, and yours truly. Experience Savannah the right way and live it up like the Joneses. Even if you can’t keep up. Here is the perfect guide for you to make the most of your Savannah visit. Mansion on Forsyth: Victorian Mansion on the Outside, Swank Bohemian Luxe on the Inside. One of the 9 Keesler Hotels in the Marriott Autograph Hotels this Mansion keeps up with the Jones in a very southern, very expensive way. And who doesn’t like throwing the word ‘mansion’ around in everyday conversation? Bohemian Hotel Savannah Riverfront: Luxury located along the riverfront. The Marshall House: Refined, rustic, historic. Airbnb: I recommend Jones Street, Bull Street area so you can walk to parks and hop on the light rail to take a quick trip uptown. 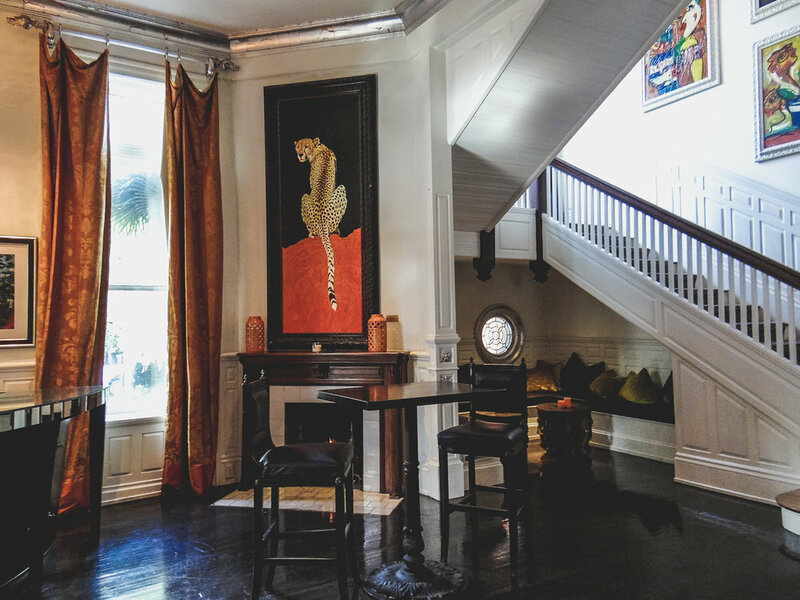 704 Drayton: Located inside the Mansion on Forsyth, this upscale restaurant marries a posh historical inn with colorful, African decor and heaven menu! Beef Carpaccio, Pan Roasted Maine Scallops, 1855 New York Strip Steak. History Tours: The quickest way to see and learn about the city. Old Savannah Tours offer an on and off tour option to capture your instagrammable moments without wandering around downtown and driving around in circles. This fun tour combines an in-depth knolwedge of Savannah history with humourous tour guides and fun meet and greets with characters from the past. On the right day, you might catch Forest Gump sitting on a bench. Jekyll Island: If you’re in Jekyll Island for the day, take a drive out to Driftwood Beach and catch the sunrise; grab a bite of tongue torching shrimp or a smoking shot at Tortuga Jacks, the island's only oceanfront restaurant (their enchiladas made me a believer), and swing by Beach House to drink one of the 24 draft beers on tap.